Logitech has some awesome deals on Amazon.com right now. 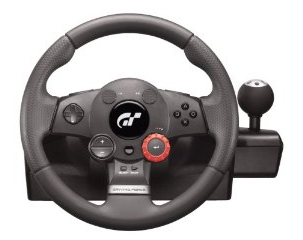 Logitech PlayStation 3 Driving Force GT Racing Wheel usually sells for $89.99 with free shipping. You can now get a $30 mail-in-rebate bringing the price down to $59.99 with free shipping. If you like racing games, this is an amazing accessory to have for your Sony PlayStation 3. I am so close to pulling the trigger with this one. Logitech 2 MP HD Webcam Pro 9000 with Built-in Microphone – $69.97 with free shipping . Price comes down to $49.99 with free shipping with $20 mail-in-rabate. Logitech V20 Notebook Speakers (Black) sells for $52.54 shipped. With a $20 mail-in-rebate you can get it for $32.54 with free shipping. Logitech Webcam C500 with 1.3MP Video and Built-in Microphone sells for $41.99. You can get it for $26.99 with free shipping after $15 mail-in-rebate.